Fire prevention officer Lt. Julia Holt “loves talking” fire safety at local schools, and recently debuted a new teaching tool to her program. Holt, with the Dickson Fire Department, visited Dickson Elementary School last week to teach home fire and hazard safety to students during library time. She brought along the department’s new Hazard House— a replica play house that lights up, projects sound and simulates an electrical arc and smoke via a remote control. “It’s fun to play with and they love it, love it, love it,” Holt said about the Hazard House. 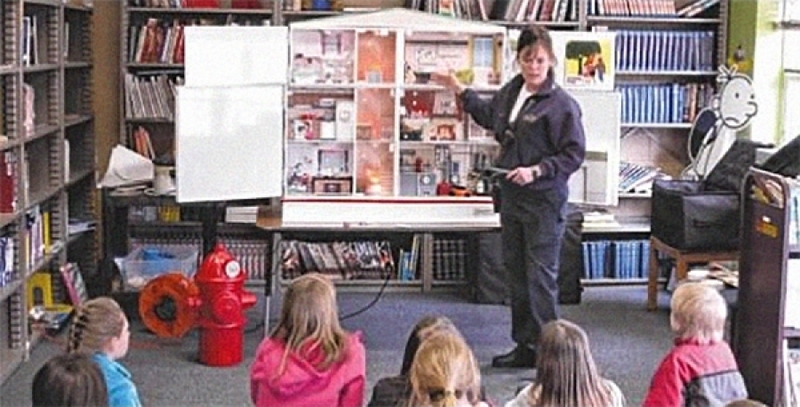 The Modeltech International Hazard House replaced the fire department’s 1983 Smoke Safety Trailer, which the city sold last year. The fire department used those funds to buy the Hazard House. Holt explained the Hazard House is very interactive and “hands-on” for the students, and keeps their attention. The 80-pound collapsible house includes three levels/floors—a basement with an office and garage (carbon monoxide hazards); a kitchen and living room with a fireplace, on the middle floor; and a bathroom and bedroom on the top level. A stairway (with trip hazards) connects all three levels, and smoke simulators demonstrate the “chimney effect” as smoke quickly rises from each floor to the top level. Velcro flaps and tokens (like Velcro carbon monoxide stickers) in each room illustrate potential hazards, like a roll of flaming paper towels over the stove top in the kitchen; or candles on a nightstand in the bedroom. The students remedy the hazards by flipping the Velcro flaps and using the props. Props and 3D parts range from a grill, lawnmower and gas can (which should be stored in the garage), to a cooking pot on the kitchen stove, rolled up towels and smoke/carbon monoxide detectors. Holt reported that Hazard House has “stepped up my teach experience a notch,” and helped her gear safety instruction toward specific areas of the home safety and hazards. The bedroom door lights up red as the smoke simulator fills the home. The red glow indicates the door is hot, Holt explained, and the rolled-up towel props placed at the bottom of the door demonstrate how the students can stop the smoke from entering the room. A tiny lighting bolt and electrical arcing sound show students the dangers of electrical cords in the bathroom. “It shows how they could be hurt or killed by the shock,” Holt said. The smoke is generated from a nontoxic fog fluid that doesn’t trigger asthma attacks, she noted, and children are under constant supervision with the electrical arc simulation. Holt told Travis Cothron’s fifth-grade class Friday afternoon that her No. 1 job is being a mom, and her family has an escape plan for home emergencies, which they practice. She explained your nose goes to sleep with you at bedtime, so smoke detectors are necessary to wake you up during a fire. Smoke detectors should be on every level of the home, she noted, outside every sleeping area and in bedrooms. Holt called on a student to place tiny smoke detector props throughout rooms in the Hazard House. The Hazard House can accommodate additional floors and settings, like farms and neighborhoods. Holt hopes to add different venues to the house each year to expand on home safety and hazards.